Eventually most armies decided in the late 19th Century to settle on light howitzers in the 65-76mm range. Easily disassembled for carriage by horse, mule or even manpack, they provided spot artillery firepower. The US was no different and developed the M1 75mm Pack Howitzer in the early 1920s for...cavalry. This gun was fitted with wooden wheels and could be disassembled for mule or horse transport. A fixed carriage version was also developed but was not popular due to its limited flexibility. The M1 carriage with wooden wheels quickly gave way to the M8 with pneumatic tires, and from then on the gun was widely produced and saw wide service. One popular use was with airborne units as it could be broken down into several loads for paradrop, and both the US and UK airborne units made wide use of it. It was also used as close support artillery with Marine Corps units. The gun itself was also borrowed and saw self-propelled use in the M8 75mm HMC and the LVT-A4 and -A5 amphibious armored vehicles. After the war the howitzer was redesignated as the M116; the reason was simple - too many “M1" guns! 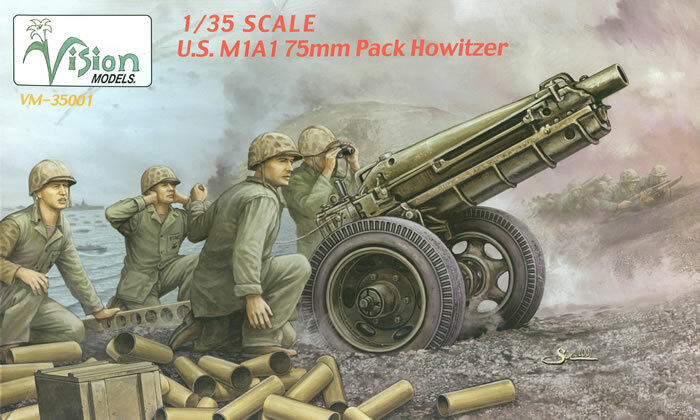 (M1 series 155mm gun, M1 series 155mm howitzer, M1 series 8" howitzer, M1 series 75mm pack howitzer...) They were used by other forces as well as in MAP during the 1950s. The howitzer was potent enough for its size and could fire a 13 pound HE-FRAG round out to 8930 meters. With a weight of only 1,340 pounds it was easily maneuvered, even in jungle conditions, in comparison with other guns and had more “bite” than the smaller 37mm M3. One documented case even has an M8 HMC knocking out a Tiger I during the Battle of the Bulge (a one-in-a-thousand shot into the open loading hatch in the back of the turret at short range). Up until now the only offerings of this gun in this scale have been either white metal or resin; while this kit has been out a while I only found one in my local hobby shop in August 2014. I believe at least Bronco also has a kit out; that may be their own kit but I know Vision has swapped some of its molds around to other manufacturers on occasion. The kit is well designed and will permit breaking the gun down into transport sections so diorama fans should be pleased. It comes with five full rounds of ammunition and a turned brass muzzle for the gun itself, which is a nice touch. The model also offers either the directionless “universal” or “mud” tires or a set of “street” tires which were also seen on the guns. Assembly requires filing a notch in the upper barrel shroud (B35) to fit on the barrel section. There are some very small parts here such as the breech lift ring (A5) so care must be taken. Note that the position of level or elevated for the barrel must be chosen here. The basic rear trail section is next followed by the specific version for the M116. The front trail section follows and then the axle and wheels. Final assembly is next and permits the modeler to mount the gun in “Battery” (travel position) or firing position. A convenient exploded view of the entire kit shows all of the parts used. Note that the towing lunette (parts B9/10) may be mounted in towing or combat position. Finishing instructions are sketchy - paint the gun olive drab and the tires black. But the kit does include a very nice set of photos of a restored gun in a museum for reference. Overall this is a nicely done effort and one which can be used just about anywhere and with any sort of towing vehicle from the quarter-ton to an M2 halftrack.